These types of injuries are common in falls and sports. The wrist is usually bent backwards when the hand hits the ground such as when someone slips or trips and falls. These injuries also frequently occur during sports such as footbal and snowboarding. 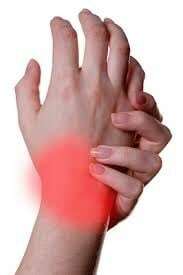 After injury, the wrist will usually swell and may show bruising. it is usually very painful to move. 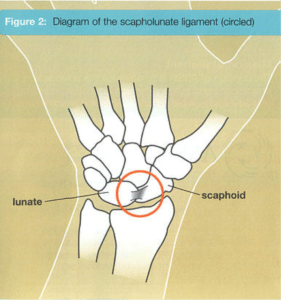 The most common ligament to be injured in the wrist is the scapho-lunate ligament (see Figure 2). 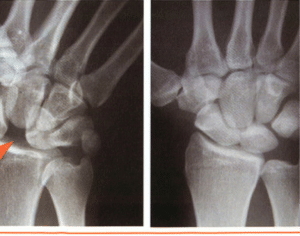 It is the ligament between two of the small bones in the wrist, the scaphoid bone and the lunate bone. 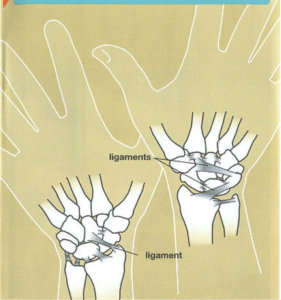 There are many other ligaments in the wrist, but they are less frequently injured. Sprains can have a wide range of severity’ minor sprains may have minimal stretch of the ligaments, and more severe sprains ma have complete ruptures of the ligament(s). Initialy your doctor will examine your wrist, to check its flexibility and stability and to see where it hurts. X-rays are taken to heck the alignment of the wrist bones and to check for any fractures (see Figure Below). Occasionally other studies such as Magnetic Resonance Imaging (MRI) may be performed.